Lenovo has unveiled its new ThinkStation P410 and P510 workstations, which are based on the recently introduced multi-core Intel Xeon E5 v4 processors with up to eight cores as well as NVIDIA’s Quadro M5000 or M6000 graphics. The updated workstations fully support capabilities of Intel’s latest CPUs and come equipped with special programs to take advantage of their features. The new Lenovo ThinkStation P410 and 510 workstations are based on Intel’s C612 PCH as well as Intel’s Xeon E5-1600 v4 or E5-2600 v4 processors that belong to the Broadwell-EP family and feature up to eight cores as well as Intel Turbo Boost Max 3.0 technology, which identifies the core with the highest frequency potential and then directs important workloads to it in a bid to increase real-world performance. The machines support up to 128 GB (P410) or 256 GB (P510) of DDR4-2400 memory; multiple storage devices with M.2, PCIe, SATA and SAS interfaces; optional Thunderbolt 3; optional 802.11ac Wi-Fi + Bluetooth 4.0 module; a variety of PCIe add-on cards, an optional ODD (using the Flex module which can also add a 29-in-1 card reader, FireWire) and so on. 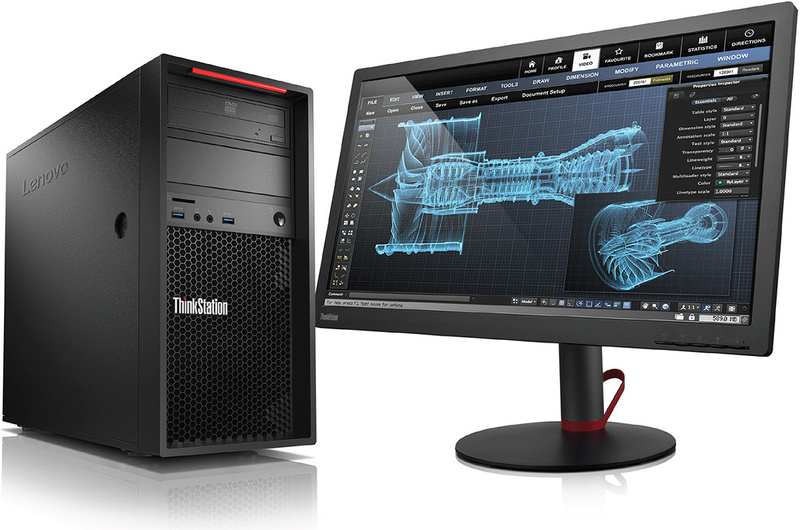 The Lenovo ThinkStation P410 is the smaller of the workstations. It supports up to NVIDIA Quadro M5000 graphics adapter (2048 CUDA Cores, 8 GB of GDDR5 ECC memory); up to two PCIe x16 cards, one PCIe x8 card and one PCIe x4 card; up to four 3.5” drives, up to four 2.5” SSDs/HDDs as well as up to one M.2 SSD. Meanwhile, the Lenovo ThinkStation P510 is the larger machine, it supports up to Quadro M6000 professional video card (3072 stream processors, 12 GB of GDDR5 memory), more storage devices and so on. 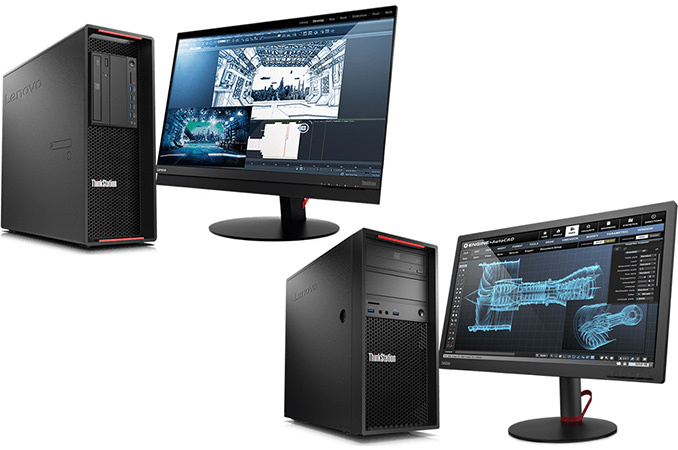 Dimensions 6.9" x 16.8" x 14.8" 6.9" x 18.5" x 17.3"
Both workstations support two important software features: the Lenovo Performance Tuner (LPT) as well as the Processor Affinity. The LPT offers BIOS management, graphics management, power management and resource monitoring. It also contains predefined application profiles that are optimized for particular professional programs (Adobe Illustrator CC, Autodesk AutoCAD 2017, ANSYS, etc.). Meanwhile, the PA allows to designate a program to run on a specific processor core(s), which is especially important because Intel’s Turbo Boost Max 3.0 technology determines the fastest cores and it is now possible to take advantage of them. Alternatively, the PA prevents apps optimized for multi-core CPUs from taking all of the available resources. As for operating systems, the new Lenovo ThinkStation P410/P510 workstations come with either Microsoft Windows 10 Pro or Ubuntu Linux. Lenovo is set to start selling the new ThinkStation P410/P510 workstations in the coming weeks or months in various regions. The company does not touch upon their pricing other than saying that the P410 will be “affordable”. However, exact prices will naturally depend on particular configurations. Additional from Ian: When we reviewed the new Intel Broadwell-E processors a couple of weeks ago, Turbo Boost Max 3 (TBM3) was in a state of disarray: while Intel supported it, it relied on the operating system having the relevant driver but also the motherboard manufacturer supporting it by default. At the time of testing, none of our motherboards had TBM3 enabled by default, instead saying that if the user wants it, they should enable it in the BIOS. Normally this is a recipe for obscurity, given so few users actually enter the BIOS (even more so in the enterprise segment). The fact that Lenovo is enabling it by default for these systems is a green flag for performance for sure. It will be interesting to see how it is implemented: on our initial software testing, the minimum polling rate for TBM3 was one second, which means it has a distinct variable effect on shorter benchmarks. If this has been somehow reduced by Lenovo, it would be a significant plus point in the design. However, we're unsure if that one-second polling rate is an Intel or driver limitation at this point. It is certainly worth keeping an eye out for anyone that reviews Lenovo's implementation. Has AT, or anyone here, messed with Xeon D for a workstation, like the SuperMicro box in http://www.anandtech.com/show/9185/intel-xeon-d-re... but with a GPU? "Lenovo is set to start selling the new ThinkStation P410/P510 workstations in the coming weeks or months in various regions. The company does not touch upon their pricing other than saying that the P410 will be “affordable”. "